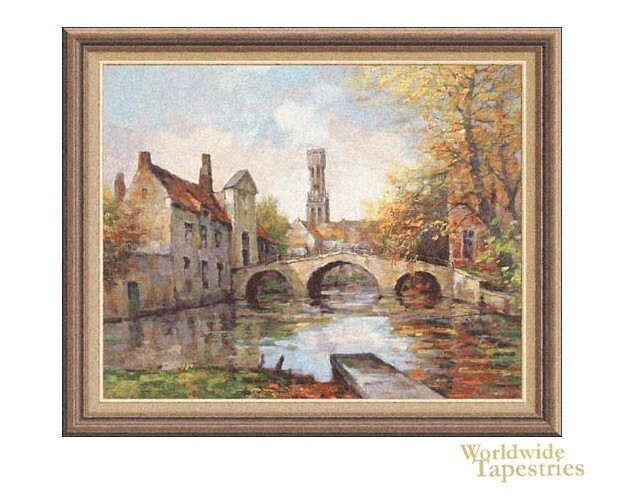 Step into a European medieval town in this tapestry "Lake of Love". This gorgeous part of Belgium known as Bruges has been unspoilt in that it has remained unharmed during war and presents us a view of what it was like to like in a medieval town in the 1400s. This bridge was part of the busy harbor system used for trade and travel in those days. This tapestry here captured the mood of this city perfectly. It is rustic, romantic and its composition is arranged to create a gorgeous balance of form and color. This tpaestry is backed with a lining and has a tunnel for easy hanging. Dimensions: W 42" x H 36"
Dimensions: W 56" x H 50"